Summer to frost. Very long flowering. Shrubby. Back of border. specimen. mass plantings. Easy in a warm sunny spot. Cut back in spring once new growth has begun (late to show). Division not needed. This plant deserves its current rise in popularity. With optimum conditions of full sun and well-drained soil, it will fare quite well in zone 4 except in the harshest winters. Wet winter soil conditions can be fatal. For those who have the correct conditions, this plant is both undemanding and striking. 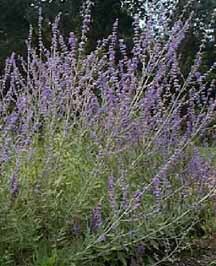 Russian Sage forms a veritable bush - a light and airy one. At 3 to 4 feet tall, it should be placed toward the back of the border. It has steely, blue spikes from midsummer right up until frost. The spikes make a nice architectural addition to the landscape and can be used in bouquets. Leave the summer's growth on the plant through the winter so that foliage can catch snow for insulation. In the spring cut back to 6 to 8 inches leaving less than 10 buds for the year's growth. With proper pruning, division is not necessary. Like most silvery plants, it can be susceptible to mildew. Take care in using mulch (do not let it rot in contact with the base of the plant) and avoid wetting the foliage during watering.